The 13th TVB Artistes Training Class just celebrated their 20th anniversary. 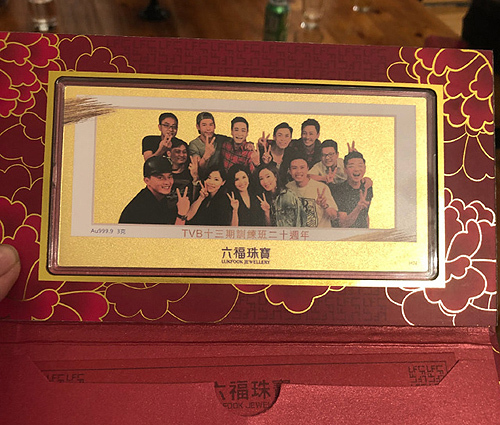 During their reunion, Raymond Lam (林峯) bought custom gold plaques for his classmates, which had an engraved image of their class photo. Artistes at the event included Tavia Yeung (楊怡), Meini Cheung (張美妮), Bond Chan (陳少邦), Tsui Wing (徐榮), Mat Yeung (楊明), and Raymond Chiu (趙永洪).Though they are all busy with their respective schedules, the former classmates continued to stay in touch over the years. Currently five months pregnant, Meini Cheung’s baby bump was definitely protruding through her pink sweater. Standing next to Meini was Tavia, whose pink bag was covering her stomach in the area. Though Tavia has not made any pregnancy announcements, many hope that she will be next to do so. Don’t see 張美妮 acting much and just remember her on variety game shows. She is very pretty then and now.